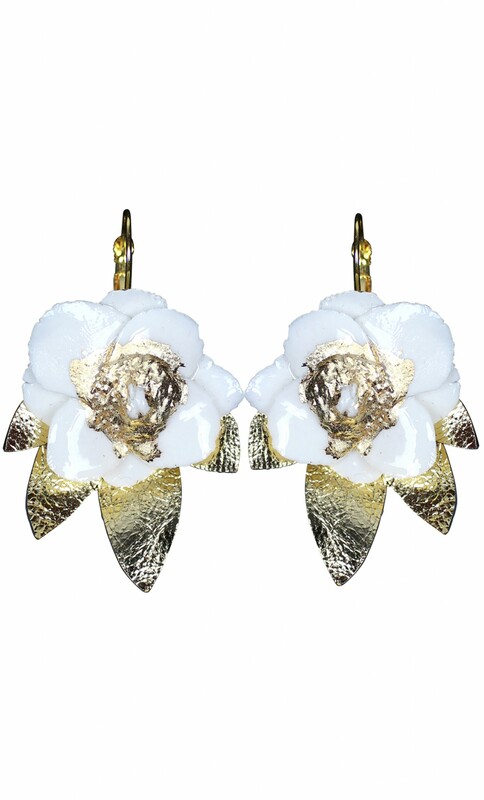 The anemone flower shaped earrings were crafted by hand from Limoges porcelain and highlighted with gold and golden tone leaves. The fastening is made from golden plated brass and also available as clip earrings (select for earrings or earclips below). PLAKINGER gave carte blanche to the French artists behind “L’Ateliers des Curiosités” who designed a capsule jewellery collection made entirely of Limoges porcelain. Handcrafted and highlighted with gold, the delicate floral and leaf-shaped accessories comprising ten fine jewellery pieces add a serious artistic touch to the womenswear collection, enhancing the silhouette and look of the SS17 creations. We are shipping internationally, for orders outside EU please contact info@byplakinger.com.